Based on art by Joelle Jones; Sculpted by Jack Mathews from Joelle Jones, the superstar artist who took Catwoman into battle, comes this statue from the DC Cover Girls line, sculpted by Jack Mathews. 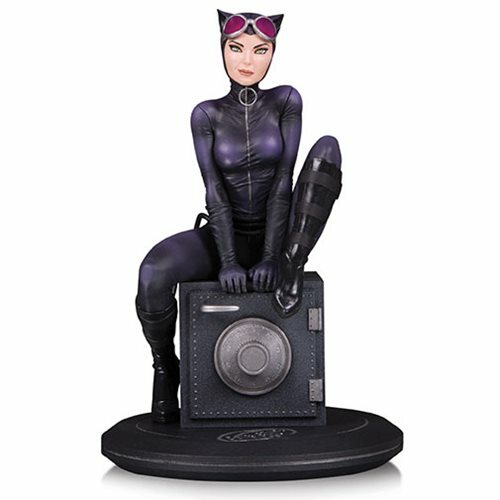 The DC Cover Girls Catwoman by Joelle Jones Statue is a limited edition 5,000 pieces. Selina Kyle lounges on a vault she's ready to crack open with a few flicks of her claws. Inspired by the powerful women of the DC Universe, DC Cover Girls is a long-running line that features dynamic depictions of the most famous superheroines and super-villains in premium 9-inch scale statues. Individually numbered. Measures approximately 7-inches tall.